Catching the sunset or sunrise in Angkor Wat, Siam Reap is a must. You can either watch the sunset/sunrise in Angkor Wat or there's an alternative spot - Phnom Bakheng or also known as Bakheng Hill. My next post is going to talk about Phnom Bakheng. Phnom Bakheng is one of Angkor's oldest temple. It was built back in the late ninth and early tenth centuries. Currently, the World Monuments Fund (WMF) is funding for the conservation of the site to prevent it from further damages. Where does Phnom Bakheng located? Well it is located 1,30 meters north of Angkor Wat. You have to purchase the ticket before entering. The cheapest ticket is 20USD per day. In order to watch the sunset in Phnom Bakheng, you have to be there by 5pm or else they will not let you hike up the Bakheng Hill. And another important thing is that, you are not allowed to wear shorts or skirt or dress above knee length and you have to wear clothes with sleeves!!!! Same goes to my previous post in Phnom Penh where you have to cover yourself up in proper clothing if you were to visit the Golden Palace and Silver Pagoda. Anyway, it took us roughly about 20-25 minutes of hiking to arrive at the summit. I was having a hard time gasping for air. I swear that I will not hike Mount Kinabalu in Sabah, even if you are willing to pay me 10k for it! Unless if you double up the amount, uhmm.. well I might consider it. HAHA! Listening to our personal guide's explanation. He is a very good tour guide. He makes history sounds so interesting! I don't really like it lor. Nak ambil gambar pun susah. Damn mad crowded! Conservation and repairing of the site. Make sure you got the right companion for your vacation as it plays a very important role. And I am proud to say that I enjoyed my trip so much because of these crazy people. I love this picture so much. Unfortunately my CMI face spoiled the entire thing. Mosaic-ed it seems like the best choice after all. Me losing fats by perspiration. After losing some weight, of course you ought to replace em' fats back yaw! The best way to do that is? Not any ordinary makan ye. Must be BUFFET STYLE! 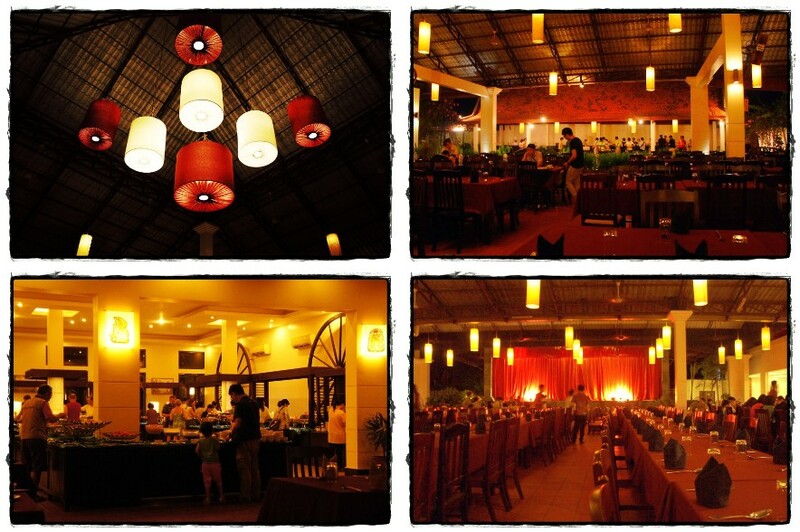 One of the best restaurant - Amazon Angkor. Love the ambiance. Unfortunately no air-conditioner. Other than that, it was perfect. 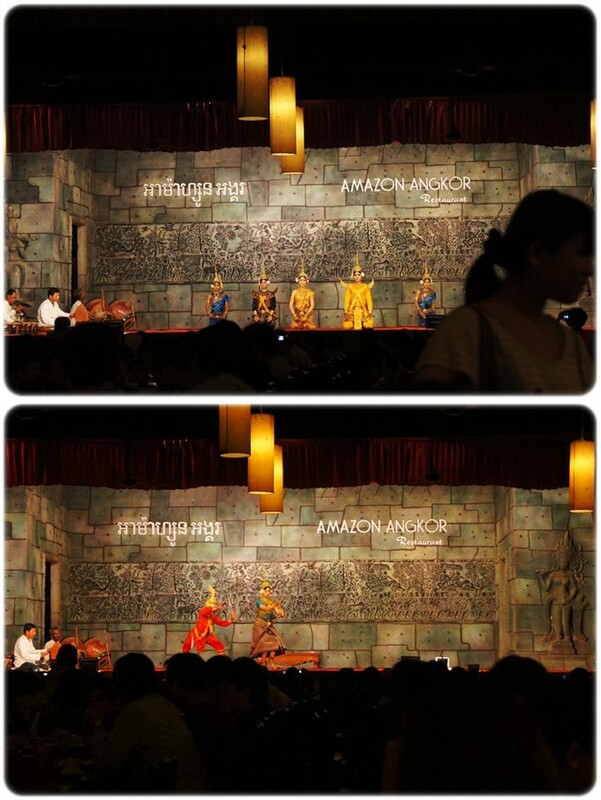 Dinner will be accompanied with Cambodian Traditional Dance Show. Trying so hard not to be the typical Malaysian who could not resist free food especially when it is in buffet style. Mak kata jangan tamak sangat. Makan apa yang patut. Jangan membazir. Well that's the thing about Malaysians, they feel that when they have paid so much for a buffet and they have the right to waste it even if their stomach couldn't take it anymore. Tak nak bagi tauke untung katanya. 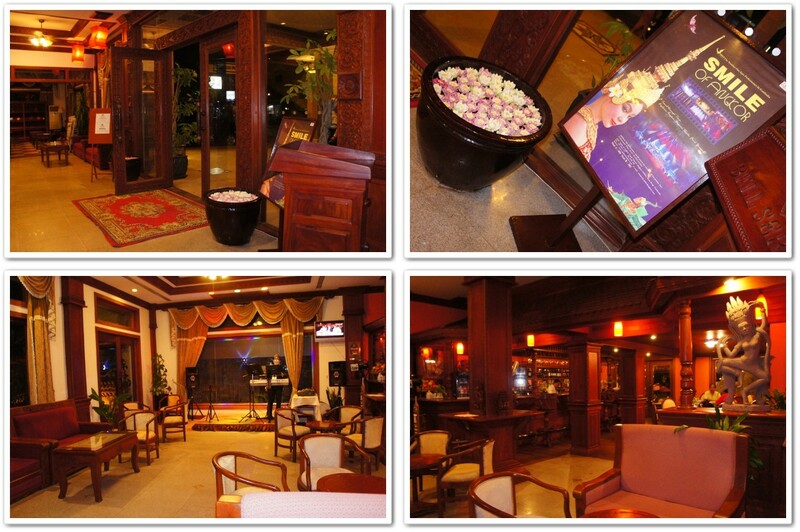 Our hotel in Siam Reap was - New Angkor Hotel. It is a 3 star hotel. However, the interior is freaking awesome! Such a cool looking lobby. Welcoming drink was provided upon checking in. For further information regarding to this hotel, visit the link below. After cleaning ourselves up from the smelly clothing, we visited the Angkor Night Market which was located about 1 to 2 kilometers away from our hotel. There are few night markets around Siam Reap. Make sure to bargain as low as possible before buying anything.